The Ancient Tarots of Lombardy | Meet the Families! 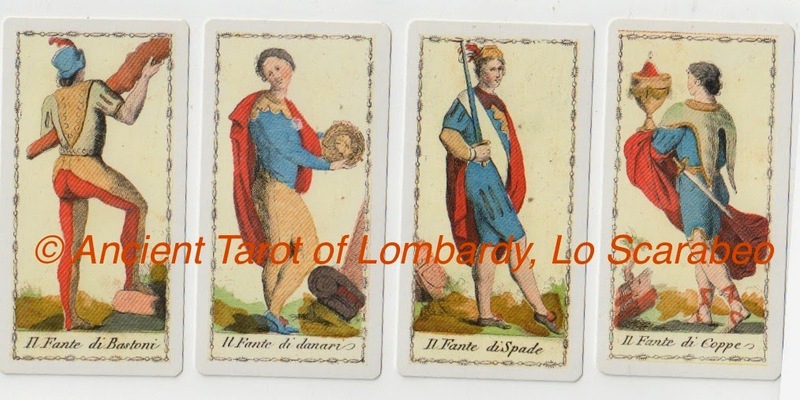 I recently bought a handful of Marseilles-type Tarot decks and the Ancient Tarots of Lombardy is one of them. This design dates from 1810, according to the box. It is published by Lo Scarabeo and comes with the LWB details (written by Giordano Berti) on cards, rather than a leaflet. I find this a bit of a faff trying to find the English section amongst the cards. But that probably says more about my untidy nature than anything else! Although I will be looking at the Court cards, I would just add (for review purposes) that the Tower is simply a tower – no flash of lightning or falling figures. Strength is Major Arcana card XI and shows a powerful man pulling open the jaws of a lion (you wouldn’t put your fingers in his mouth if you were pulling it closed, imo!). Minors are unillustrated pips. The Fante equates to the ‘Page’ in other decks. The Cavale equates to the Knight card. Look at all these Cavale – or rather look at their horses’ asses, because that’s pretty much what we’re presented with here! By presenting us with the back view of these cards, how do you feel? That you are witnessing action, unseen? The Cavale of Wands and the Cavale of Spade are in almost identical poses (with the exception of the activity levels of their horses). The Cavale of Coppe looks absolutely lost….but the Cavale of Danari looks like a young Alexander The Great, or Napoleon. Note that the Cavale of Danari and Cups don’t hold their symbols. The Cups Knight isn’t even looking at his symbol…. No surprises here – Regina equates to the Queen cards. The Queens are, other than the symbol of their suit, quite personality-less. Queen of Swords has sceptre and sword and looks quite cheerful for a widow. Re equates to the standard King card. The Kings are all mature, except King of Swords who looks substantially younger than the others. All sit in more or less same position. Danari doesn’t hold his suit symbol, but does hold some kind of sceptre. Take a good look at the King of Swords – he looks genuinely startled – see his left hand and expression. King of Cups has ram’s head on throne and the King of Pentacles has man’s head on throne, neither of which correlate to astrological associations currently used for these Courts. I’ll be honest, I didn’t like this deck when I started examining it. The long neck of the Fante of Cups was a bit freaky (and a couple of the head/necks in the Major arcana are similar) and the bog-standard representation of the Queens left me cold. However, the style of the deck is growing on me and I must admit, the etchings are beautiful. If you like a lot of symbolism in your decks then this might not be for you, but if you are an experienced reader, looking for something classically-inspired to add to your collection, this might just be for you. Do you own this deck? What do you think of it? I used to have this deck many years ago. The tarot-artist Chris Butler kindly sent me this and a few other Marseille-style decks as a gift. To be honest, it never did anything for me. The courts felt as though they lacked personality, so I found it kind of hard to become inspired by them in readings. As I have mentioned in my reviews of other decks, a court-gang can make or break a deck for me. As attractive as these engravings are, they didn't really fit for me back then.